Acadian Genealogy Homepage; Acadian-Cajun Chat Room! Note: Allow a couple of minutes for the Chat Room (below) to "load"! This ACADIAN-CAJUN Chat Room is provided for the convenience and pleasure of all Cajun cousins and friends and is intended to be used primarily for those folks wanting to discuss Acadian/Cajun genealogy and history. The service is "free of charge" (telephone or otherwise). Feel free to chat with anyone, but please remember to be polite and respectful of others who may be in the "room" with you. A) Merely enter your 'nickname' (mandatory), real name (optional) and e-mail address (optional) where indicated and then click the "OK Connect". Then, once connected, begin to enter your message where it indicates "type here". Next press the 'enter key' of your computer keyboard. B) Chat messages are displayed in the 'chat message area'. To add to the conversation, type-in your message in the text box (below the message area). C) By default your message is sent to all users. To send a message to a particular user, highlight the user from the 'users list' on the right, select the Private User radio button and type your message. Everything you write will remain "private" until you turn the Private User off. D) To screen-out obnoxious users, highlight the user from the 'users list' on the right and then select the Ignore User check box. E) To end your chat session, click the Log Off button. F) The About button, displays information about ParaChat in the message box. G) The Surf button, opens a new browser and displays the last URL typed in the message box. H) The F.A.Q. button, displays the Chat Frequently Asked Questions in a new browser. I) The Float button, displays the chat window in a floating browser. 1. Probably one of the best way to try it out, is to contact one of your friends and arrange for him/her to 'meet' you in the Chat Room at a specific time. Remember, you both must connect from the link on this Acadian Genealogy Homepage. 2. Acadian-Cajun cousins, most of which are members of the ACADIAN-CAJUN Mailing List meet here every Sunday evening, starting at 7:00 PM (Eastern time). Not a member of the Mailing List yet? Complete details on "free" subscription available by clicking the previously underlined text. 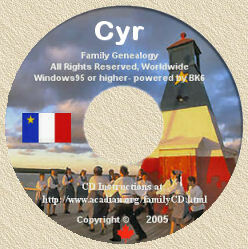 Join today and share Acadian-Cajun genealogical information with the hundreds of members on the Mailing List. 3. Usually, if/when you are unable to connect and enter the 'Chat Room', it is due to the ParaChat Server being too busy. In such instances, do _NOT_ click the 'OK, Connect' button multiple times, since this will only slow the process. Merely try re-logging on, in a few minutes. Would YOU like to host a chat room session for some of your Acadian-Cajun friends...maybe from your genealogy society/association? Merely pick a time, day(s) of the week and contact them (probably, best using e-mail) and invite them to join you here for a group "chat" (suggest you keep it to a maximum of 25 persons). It's that simple! I hope many will take advantage of this terrific opportunity to exchange ideas and genealogy research information...at no cost to anyone! So, what's involved to "hosting" a chat session you ask....in its simplest term, the 'host' acts, more or less, as the moderator of the discussion. It's that simple. This Chat Room is merely provided as a "free" service for its members and the webmaster/owner of this web site neither endorses or monitors the actual discussions which take place and therefore, will not be held liable for any/all consequential "chatting" which may occur. Please report any/all misuse of this Chat Room to Yvon Cyr.